Perennial. Zone 4. Scrophulariaceae. Mid-Eastern North America, including Manitoba, Ontario and Quebec. A.k.a. FOXGLOVE PENSTEMON. Some years ago Penstemon digitalis ‘Husker’s Red’ was absolutely everywhere, and being touted as something of a wonder plant – “Long blooming!” “Beautiful foliage!” “Drought tolerant!” It was the Perennial Plant Association’s “Perennial of the Year” in 1996, which is generally a recommendation of good garden merit, but in this case I do believe the hype was greater than the plant proved to be. I grew it for a few seasons and thought it nice enough in a minor-key way, but when it succumbed to a not-particularly-hard winter, I shrugged and moved on. ‘Mystica’ is the offspring of ‘Husker’s Red’, and has proven to be a generally better plant than its parent. Released in 2008, ‘Mystica’ is not receiving nearly as much promotion as its ancestor, but the word in the gardening world is uniformly positive. I’ve been growing it for four or five seasons now, and I have found it quietly attractive and reliably hardy. Penstemon digitalis is a showy North American wildflower, widely adapted to various soils and happy in full sun to light shade. It is drought resistant to the point of being included on xeriscape lists, though the nicest specimens are those which receive at least a bit of attention in the way of decent soil and some summer moisture. Both ‘Husker’s Red’ and ‘Mystica’ are selections of the species, developed by choosing the seedlings with desirable traits (dark foliage, showy flowers, long bloom time, hardiness) through successive generations. ‘Mystica’ makes a tidy clump of purple-flushed, silky-smooth foliage. 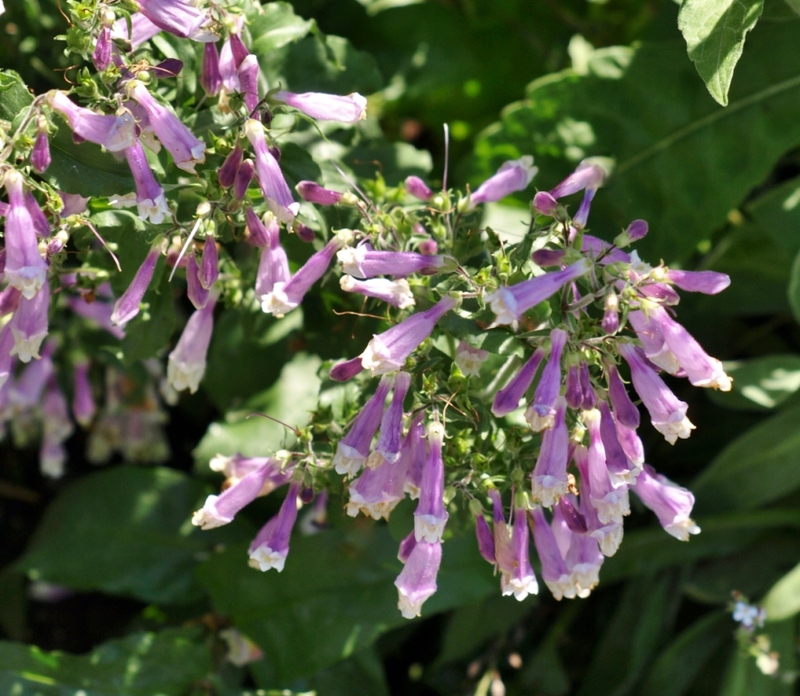 18 to 24 inch tall bloom stems emerge in early summer, and produce pretty, white-blushed-with-purple rather foxglove-like blooms for 3 to 4 weeks. Once the flowers drop, the glossy purple seed pods provide garden interest. The foliage stays attractive right until first snowfall, responding to cooler autumn temperatures with a reddening of its dusky leaves. As with all of the Penstemons, hummingbirds love ‘Mystica’, as do numerous types of bees and other insects. It is nice towards the border front, and is tidy enough for the rock garden. In general, a good plant, attractive for three seasons and adaptable in a wide range of conditions. ‘Mystica’ is propagated by seed, so plants are a bit variable as to ultimate height and coloration of foliage. Occasionally a mostly green plant shows up in a batch, but when I kept a few of these instead of rogueing them out, I found them to be perfectly acceptable, blooming away nicely with their showier-foliaged siblings, and adding some contrast to the small colony in my garden. Perennial. Zone 1. Asteraceae. Achillea millefolium is native to the Northern Hemisphere, and is found in Europe, Asia, and North America. Common names are numerous, including MILFOIL, BLOODWORT, SOLDIER’S WOUNDWORT, and SANGUINARY, most in reference to the plant’s reputation as a wound-healing herb. The common name Yarrow comes from the Anglo-Saxon gearwe, “to make healthy”, in reference to the plant’s long use as a medicinal herb. Millefolium = “thousand leaved”, for the finely cut, ferny foliage. The species form found most commonly in the wild, Achillea millefolium, has pure white blooms, but there is an Appalachian strain, A. m. var. rubra, which has been “improved”, and which has contributed its rich colour to numerous garden cultivars. Red-Flowered Yarrow has been a common garden plant for at least a century in North America. The Red Yarrows produce many flat-topped heads – corymbes – of small, ash-grey-eyed, rosy pink to deep red blooms on sturdy 18 to 24 inch tall stems in summer. The bloom time is long, and cropping off the spent flower heads will keep more coming. Foliage is deep green, beautifully ferny, and pungently aromatic when crushed. All of the Red Yarrow cultivars are very easy and dependable. The plant spreads from a central clump by creeping, rooted stems, but it is well behaved and easy to curb. It is also decently drought tolerant, so worth consideration in xeriscaping. These plants will get taller and appear more lush with good soil and supplemental summer moisture. The Red Yarrows are very good cut flowers and everlastings if cut in the early bloom stage. ‘CASSIS’ – Many corymbes of small, intensely burgundy red flowers on 18-inch tall stems in summer. Cut as everlastings these dry to a rich black currant colour, hence the cultivar name. Very easy and dependable. This cultivar was a European Fleuroselect Winner in 2002, chosen for garden merit. ‘CERISE QUEEN’ – This cultivar been around for quite a few years. It has corymbes of cherry red blooms which fade through stages to a washed-out almost-white. It has a long bloom time, spreads steadily but not invasively, and is essentially as tough as nails. 12 to 24 inches tall, depending on richness of soil and amount of moisture. You may also come across ‘RED VELVET’, ‘STRAWBERRY SEDUCTION’, ‘SUMMERWINE’, and several others. All are fairly similar in habit, though degree of redness will vary. The red flowers of all of these will fade as the bloom season progresses, ending up a greyed pink-white. As mentioned earlier, clipping these off will keep the plants looking fresh, and will usually trigger re-bloom. Average soil and moisture, sun to light shade. Drought tolerant once established. Perennial. Zone 3. Asteraceae. Central Europe, namely France, Italy and Spain. Tomentosa = Latin term meaning “covered with hairs”, referring to the dense silver hairs covering the leaves and stems of this species. This tends to be one of those quietly ignored species. It is not showy or particularly exciting, but it is completely charming, especially in spring, when its freshly-emerged woolly rosettes are truly beautifully, especially when misted with tiny drops of morning dew. After emergence of the ferny, fuzzy foliage rosettes, densely furred bud clusters emerge in May, opening up into corymbes of clear yellow flowers on 6 inch tall stems. These bloom through June and into July. The bright yellow tarnishes as the clusters fade, and the plants can then be shorn of bloom stalks, which, quite frankly, look rather tatty once flowering is finished. The foliage and flowers are warmly aromatic when touched. Achillea tomentosa is well suited to rockery or border edging, and thrives on well drained soil. It is very drought tolerant once established, and is a good xeriscape plant. It spreads to a foot or so in diameter, and makes a good cover plant over small bulbs such as crocus or species tulips, or early spring-blooming alliums. The main named variety found under the name Achillea tomentosa is ‘Maynard’s Gold’, also listed as ‘Aurea’. There is another tomentosa-connected cultivar, ‘King Edward’, a hybrid cross (Achillea x lewisii), which is taller, with soft sulphur yellow flowers. Sun, average soil, good drainage. Perennial. Zone 2. 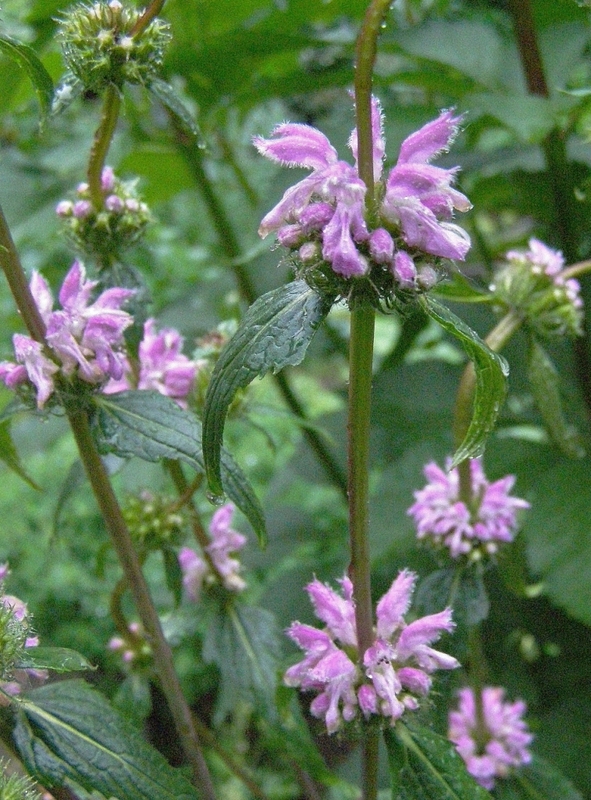 Lamiaceae, formerly Labiatae. Eastern Europe, Turkey, Iran, Siberia. A plant of steppes and dry meadows. The quirky Phlomis genus has always rather fascinated me. Without any real hope of having them succeed, I’ve labouriously grown from hard-to-germinate seed and promptly lost their first winters the beautiful yellow-flowered Phlomis fruticosa (Jerusalem Sage) and P. russeliana (Turkish Sage). “Root hardy to Zone 5,” say those who should know, but sadly that doesn’t seem to be good enough. But I will doubtless try again, for I’ve just been through the Mediterranean section of Van Dusen Garden in Vancouver, and even in its autumn disarray Phlomis fruticosa looks darned good, all velvet foliage and intricate seed heads. So I turned my attention to the only other readily available species on the seed lists I had access to, the pink-flowered Phlomis tuberosa. A few seeds sprouted, and quickly grew into sturdy young plants, with dark green, elongated-heart-shaped foliage. Planted out, these survived their first winter with vigour, re-sprouting in spring in much more substantial clumps than I had anticipated. By year three, obviously happy in their Cariboo home, long bloom stalks appeared in late May, with whorls of intriguing buds, each sporting a pair of elongated leaves at the base. The buds eventually popped open into the most fascinating small, mauve pink, delicately fringed dragon’s head flowers. Not as spectacular as the much larger blooms of my yearned-for Phlomis fruticosa, but charming nonetheless. Phlomis tuberosa has now been in my garden for almost two decades. It keeps getting moved around, and I’ve lost track of the many places I’ve rather heartlessly plunked it down in during our endless plant shuffles, for I found out early on that it was an agreeable sort of creature, easy to transplant and happy almost anywhere. Phlomis tuberosa is a slender sort of plant. It will reach 3 or 4 feet tall in bloom stage, with numerous wiry, angular-sided stems arising from a tidy basal rosette perhaps a foot or so in diameter. Foliage is excellent and looks good spring to fall, being glossy, dark green, and roughly heart-shaped. Whorls – technically “verticillasters” – of tiny, tubular, deliciously fringed pale purple-pink flowers in tiers on the slender but sturdy red-blushed stems appear in late spring. Each “ring” of blooms in the cluster opens at the same time, and the quiet show goes on through June and often into July, after which the developing seed heads may either be clipped off or left for garden interest. Phlomis tuberosa has never needed staking, despite its height. The roots are quite fascinating, as you will find if you have reason to transplant a mature plant. Hanging from the ropy root clusters are many perfectly round tubers, like tiny potatoes. These are apparently quite edible – though please don’t experiment only on my say-so! – and were used as food by indigenous peoples in the plant’s native ranges. Those storage roots may also explain Phlomis tuberosa’s wonderful adaptability. Established plants can take severe drought, and hold their own well among encroaching grasses, which has led to its use as a flowering accent in the famous “prairie borders” of such influential landscape designers as Holland’s Piet Oudolf. A potentially useful xeriscape plant for the Cariboo. Though you may see Phlomis tuberosa rated at a conservative Zone 6 or so in much literature, rest assured that it is a lot hardier than that, and, if planted in the spring and given a growing season to get its roots down, can handle Zone 2 conditions without any trouble whatsoever. This is not a particularly showy plant, but it is happily interesting, and I hope to continue growing it for many years to come. I’ve just pulled my own much-abused plants out of a border where they were being overshadowed by a massive Joe-Pye Weed, and have plunked them in the nursery rows in the garden to await a new placement come spring. I’m not quite sure where they will end up this time around, but I do know that they are “keepers”. Bees and butterflies love Phlomis tuberosa, too. It may be grown in sun to light shade, and can handle any sort of soil. Good with sedums and ornamental grasses. You may see Phlomis tuberosa listed with a cultivar name. A commonly seen tag is ‘Bronze Flamingo’, though as far as I have been able to discover this is merely a plant trade invention to up the appeal of the rather ho-hum species name. If visiting specialty plant nurseries on the coast, you may come across a cultivar named ‘Amazone’, which is reported to be an improvement of the species type, being larger in all of its parts and much taller, apparently to 7 feet. Perennial. Zone 4. Labiatae. Central and southern Russia, Romania, most notably in the Transylvanian Alps. We are fortunate in the Cariboo in regard to our many summer perennial plant choices. The Salvias in particular appreciate our generally hot and dry summer season, and this handsome species puts on a grand show in July and August. 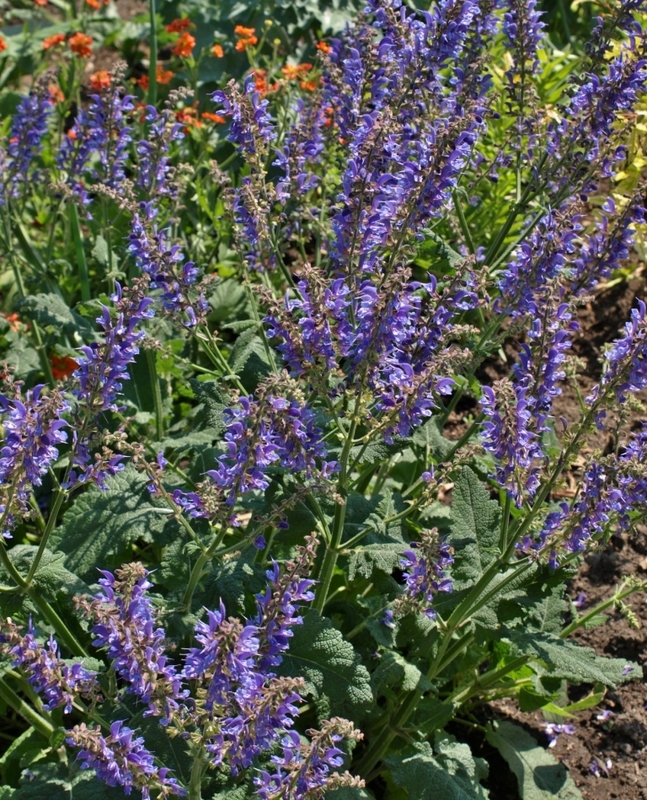 Large, dusky indigo-blue-violet flowers, “dragon head” shaped as is typical of all members of the Salvia genus (the Sage Family), are produced in loose whorls on multi-branching 18 to 24 inch tall bloom spikes. These arise from substantial rosettes of long, prettily wrinkled, rather hairy, deep green leaves. Foliage is slightly aromatic when touched, but is much less pungent than many of its relatives. A vigorous plant can be 2 feet or more in diameter, and rather sprawling in habit. Great on a slope, or under high-pruned, not-too-dense shrubs such as roses or spirea. Transylvanian Sage blooms for a long period in summer, and, if spent spikes are clipped off occasionally, well into autumn. Grand for a sunny border, and drought tolerant enough to be a good xeriscape plant. Plant it under roses in the traditional border, or with sedums and ornamental mulleins in the dry border. The colour harmonizes marvellously well with almost anything, and can be used for gentle compliment of other pastel shades or to set off hotter colours. I have found that Salvia transylvanica overwinters extremely well as a young plant, but sometimes tends to bloom itself out, so I do not consider it particularly long lived. Allow it to set seed, and you will find enough babies to keep it going in your garden. These transplant well if you move them at a young age. Older plants should be left undisturbed; I wouldn’t recommend transplanting or dividing. Sun is best, though very light shade is acceptable. Average to well drained soil; average fertility; average watering. Nicely drought tolerant once established. Perennial. Zone 3. Compositae. North Africa, Spain, Mediterranean regions. Syn. Anacyclus depressus, syn. A. maroccanus. A.k.a. SPANISH CHAMOMILE, ALEXANDER’S FOOT. Though I can find no reference to it other than the name on a number of alpine plant society lists, I am assuming that the latter allusion is to Alexander the Great and his historical presence in the areas where this plant grows. This small charmer completely bewitched me the first time I grew it many years ago, with its tidy, fern-leaved, very furry foliage rosettes, and I was thrilled when it overwintered and bloomed enthusiastically in the spring. I’d rather wondered, what with its warm-climate origins, but hardiness doesn’t appear to be a problem, as long as the plant has its roots down in well-drained soil. Little white daisy flowers with crimson petal undersides emerge in spring from mats of ferny, curling foliage. These open wide in the sun, but close up on cloudy days and in the evening, showing off the vividly contrasting rosy blush on the petal undersides. Bloom stems radiate in a circle from a central point; plants are literally circular in shape, and tightly hugging the ground. A quietly beautiful rockery or edging plant. To about 4 inches tall, and a foot or so wide. 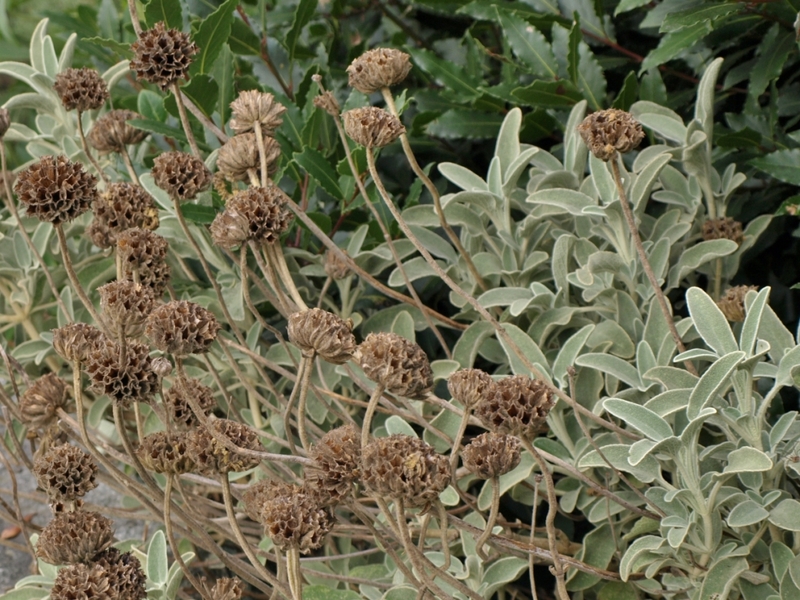 Its only flaw is that it often blooms itself to death, so you will want to leave some seed heads to mature to self-sow, or to collect seed for a guarantee of replacement plants. Full sun, and well-drained soil. Very happy among rocks, or on a slope.